Many Christmas customs were transplanted from country to country in the nineteenth century. The Christmas stocking was from Belgium or France; while the “Merry Christmas and Happy New Year” was the old English greeting shouted from window to street and from street back to window. Natives of Jamaica brought Christmas masks and mummers, while Santa Claus (St. Nicholas) came from Holland. The most exceptional tradition, the richly decorated and splendidly illuminated Victorian Christmas tree, was from Germany. 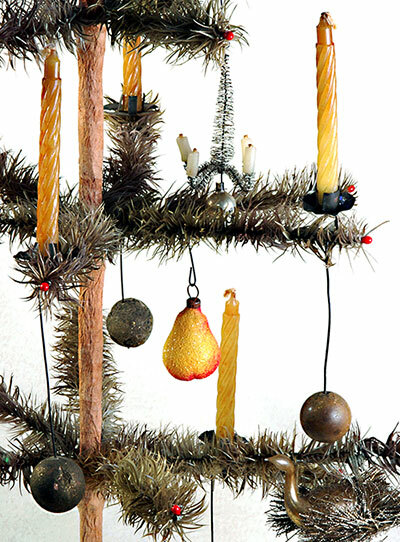 During the Victorian era, Christmas trees were lit with burning wax tapers attached to the tree. The tree could be decorated with all green candles or assorted colors; if white candles were used, the tree was sprinkled with artificial snow. Reflectors of polished tin and brightly colored paper in every shape of star, leaf, fruit, or flower surrounded the candleholders to reflect the light. There were also a variety of holders: candleholder clips, glass candle cups called Fairy Lights, and these counterweighted taper holders. An advertisement in 1900 listed "Wax Candles for Christmas Trees” in assorted colors for 12 cents for a box of 48; “Adjustable Candle Holders” were priced at 10 cents a dozen. Whether the colored wax candles were held by expensive gilt taper holders or twisted bits of tin, the result was the same – a brightly illuminated Christmas tree! 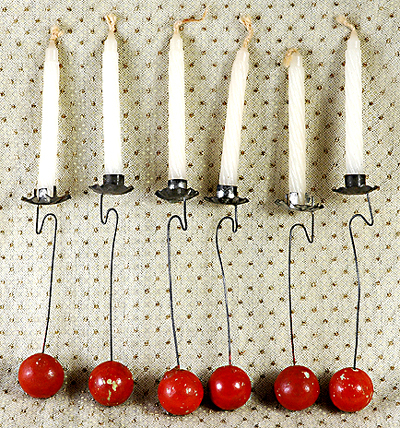 Counterweighted candle holders were one of the most commonly used devices. They had a hanging painted clay ball whose weight would always keep the candle upright. Displayed above are six rare beautiful antique counterbalanced American-made candleholders from the 1860s with antique tapers. Holders are made with clay weights painted gold. Below are rare counterbalanced American-made candleholders. These holders are made with clay weights painted a rich red (a hard-to-find color) and are much easier to use than clip-on holders -- you simply place them on your feather tree or living tree branch and they balance beautifully on their own due to the clever counterweighted design. Photos courtesy of Dresden Star Ornaments. Visit the Dresden Star Ornaments web site to see their many handmade Christmas ornaments. 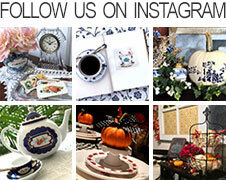 Visit www.victorianornaments.com.